For over 25 years, Mathematica has defined technical computing. It provides the principal computation environment for millions of innovators, educators and students worldwide. Widely admired for for its technical prowess and ease of use, Mathematica provides an integrated, continually expanding system which covers technical computing. Mathematica Online, it is available in the cloud through any web browser and on all desktop systems. With over 25 years of experience, Mathematica is unique in its support for today’s technical computing environments and workflows. Mathematica has around 5,000 included built-in functions covering all areas of technical computing which work perfectly together. 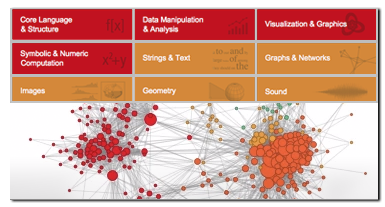 Mathematica excels in all areas including networks, images, geometry, data science, visualization and machine learning. Mathematica builds in unprecedentedly powerful algorithms many of them created at Wolfram using unique development methodologies and the capabilities of the Wolfram Language. Superfunctions, meta-algorithms… Mathematica provides a progressively higher-level environment with maximum automation for efficient work. Mathematica uses the Wolfram Notebook Interface, allowing organization within documents that include text, runnable code, dynamic graphics and user interfaces. With its intuitive English-like function names and coherent design, the Wolfram Language is uniquely easy to use. 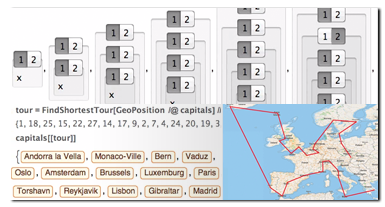 Get started on any project with help from 150,000+ examples in the Documentation Center, nearly 10,000 open-code Demonstrations in the Wolfram Demonstrations Project—and a host of other resources. 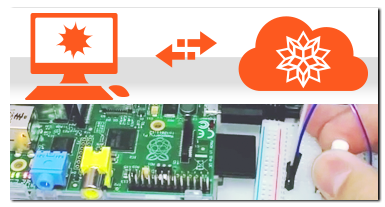 Mathematica is now seamlessly integrated with the Cloud—allowing sharing and cloud computing. Mathematica is built to be connected to everything: file formats (180+), other languages, APIs, databases, programs, Internet-of-Things devices—and even distributed instances of itself.